What are the specific details? What has past experience taught me? What does my body need (if relevant)? Are there any new ways of seeing this? What are the consequences of each alternative? What is the logical cause and effect of each action? Are you being objective or letting the needs of others sway you? Will this decision be ethically right to you? What are your feelings about the actions involved? How will other people respond to the decision? Will others be negatively or positively impacted? It can be hard for us to look at a decision from each of these perspectives. If you’re a thinker you’re naturally going to want to stay in the thinking realm of analysis. If you’re a feeler you’re going to be more focused on the feeling realm. For an intuitive listing the nitty-gritty details can feel like a waste of time, and for a sensor brainstorming can feel like a useless distraction. But we tend to regret our decisions the most when we’re blind to the four different ways of seeing things. Here are some of the ways each Myers-Briggs® personality type is vital in making a decision. Go to an ENFP when you need someone who can look at a problem from multiple angles and perspectives. These types can find options and alternatives when you get stuck in “tunnel vision” or feel trapped. ENFPs are also good at looking at the ethics of the people involved in a decision. Who’s being authentic or phony? What do people really want? What decision lines up with your values and what you are searching for in life? ENFPs can help you to stand up for yourself and not get swayed by the crowd or peer pressure. They can help you to see avenues and possibility where before there were none. ENTPs can give you a host of theoretical solutions to a dilemma. These types naturally think outside-the-box to find novel pathways other people have missed. They enjoy problem-solving when the situation is dire and traditional avenues have failed. They’re good at improvising and innovating on-the-spot. They’re also skilled at weighing the pros and cons, finding logical loopholes, and making sure everyone’s being objective. INFPs are good at examining the ethical matters involved in a decision. They can be a moral backbone to a community or business and notice when people are being hypocritical, inauthentic, or manipulative. You’ll want to find an INFP if you’re not sure if you can trust someone, or if you aren’t sure if you’re doing what’s right for you or in line with your values. INFPs are also good at seeing unusual solutions and alternatives that other people might miss. They enjoy brainstorming solutions and thinking outside of traditional boundaries. INTPs are skilled at deeply analyzing a problem from numerous angles, sifting out any inaccuracies, and finding the most workable solutions. They don’t like to be rushed so don’t ask them to make up their mind about something on the spot. When you need someone who can think-outside-the-box, root out bad data, and find ingenious solutions to complex problems, INTPs are the ones to go to. They enjoy, and are good at, solving unusual problems that stump everyone else. ENFJs are good at understanding the social, human dynamics involved in a decision. They know who will be impacted and how, and how to resolve conflict and think of the long-term implications for people. ENFJs are emotional strategists and they know how to handle a lot of conflicting personal opinions and find a way to unify people towards a common goal. You’ll want their help in a decision when people can’t agree, when you can’t figure out who’s trustworthy, or when you’re struggling to think of long-term possibilities or consequences. ENTJs have a gift for streamlining systems and procedures to make them more effective in the long-term. They are visionary thinkers who can tell you what the big-picture implications will be for any decision, and they can also bluntly tell you whether your idea is logical or just plain stupid. They decide based on future potential, effectiveness, and logic. They won’t mince their words to protect your feelings, so you can count on them to be honest and straightforward with you. They’re the people you need when you’re not sure if your next move is going to be effective or stand the tests of time. INFJs are all about the big picture and seeing things from numerous perspectives. They look at a situation and identify the most likely way it will play out, especially if there are people involved. You’ll want to find an INFJ when you’re not sure how a decision will impact people, how it will evolve in the future, or if you need a fresh perspective on things. The empathy that INFJs provide can help you to feel understood when you’re struggling with a decision. They can provide helpful insight without making you feel “bossed” around. INTJs are all about strategy and understanding what moves to make to reach a specific outcome. You’ll want to find an INTJ when you’ve got a big decision but you’re feeling stuck on one perspective. They can offer you a new way of seeing things and they can also tell you the potential roadblocks or struggles you might face as a result of your decision. INTJs are deeply logical and objective, so don’t expect them to sugarcoat their opinion. You can count on them to be honest, insightful, and forward thinking. ESFPs are the people you need when you’re not sure if a decision is realistic or based on actual facts and evidence. ESFPs are realists who are also gifted with an ability to understand human emotions and authenticity levels. You’ll want to find an ESFP if you need help clarifying the facts, looking at what’s real versus what you’ve just imagined, or when you’re not sure if you can trust someone. ESFPs are usually quick to pick up on manipulation and phony behavior so they can be helpful when you’re not sure about a relationship or you’re not sure of your instincts. ESTPs are skilled at analyzing problems objectively in make-or-break situations. They like a challenge and they like “saving the day” when everyone else is panicking. 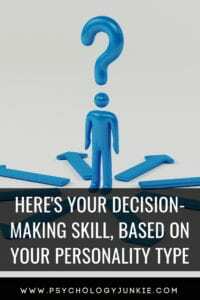 Turn to an ESTP when you’re not sure if your decision is realistic, objective, or workable in the real world. If you’re worried that your imagination is running away with you, or if you’re in the midst of a crisis and need a logical solution, an ESTP is your go-to man (or woman). These types think quickly and are good at trouble-shooting and finding practical solutions during high-stakes situations. ISTPs are the people you need when a real-world crisis erupts and you need someone calm, objective, and fiercely logical. These types are good at taking stock of the concrete details other types might have missed and piecing together practical solutions. Like the fictional ISTP MacGyver, these personality types are good at finding resources in unusual situations where there seems to be no answer in sight. If you need someone who’s objective, realistic, analytical, and skilled at weighing many different pros and cons, find yourself an ISTP. ESFJs are skilled at creating harmony and organizing people to get a job done. They are extremely grounded in reality and pride themselves on keeping a level head. They are the types you turn to when you have a lot of people to organize and you’re not sure how to do it in an effective way. They’re also good at peacemaking or creating a feeling of community and comfort in their environment. They’re the people you turn to when you need to organize an event or situation in a way that will meet the needs of others. They are also good at providing empathy and direction in complex social issues or dilemmas. ESTJs are all about being efficient and effective. When you’ve got a big goal to accomplish and you need some help breaking it down into a sequence, these types are indispensable. They are good at seeing the facts and realities along with the logical pros and cons and consequences. They’ll tell you directly if your plan or decision is illogical and they’ll let you know if your perspective isn’t realistic or lacks facts to back it up. If you want some direct, no-nonsense, practical decision-making, an ESTJ is essential. ISFJs offer a calming, practical presence to any situation and are usually good at offering advice relating to the needs and real-world concerns of the people around them. They are usually grounded, level-headed, and full of common sense and good nature. When you’re not sure what the facts are, what the background to a situation is, or how a decision will impact others, ISFJs are excellent to turn to. They offer empathy and warmth and can tell you the inter-personal pros and cons relating to any number of solutions. They decide using realistic, provable data and emotional intelligence. ISTJs are known for their level-headedness, reliability, and logical thinking. These personalities look at the facts, the tried-and-true methods, and the history of a situation to figure out which decision will be the most foolproof. They are good at staying calm and they don’t mind taking their time to quietly analyze the details of a situation to make sure they aren’t being too hasty or misguided by their feelings. They are the ones you turn to when you want thorough analysis, a realistic outlook, and a logical sequence forward. Did you enjoy this article? Do you have any thoughts or disagreements? Let us know in the comments!